Not all women are suitable for an immediate reconstruction. A reconstruction performed at a later time (delayed reconstruction) can also produce a very natural looking breast. Usually a larger area of skin needs to be introduced for a delayed procedure, as the natural breast skin envelope has been reduced at the time of the initial mastectomy. 1. The lower abdominal tissue or a TRAM flap (Transverse Rectus Abdominis Myocutaneous flap). This is a situation where it is better to be larger, and have an excess of tissue in this area. An added bonus of this technique is that you also get a tummy tuck or "abdominoplasty". A pedicled flap - the tissue is "swung" into place whilst still attached to the patient's body. A free tissue transfer. Using microvascular techniques, the tissue is detached from the abdomen and its blood flow is restored by joining it to a new blood supply on the chest. 2. The upper back skin as a latissimus dorsi flap. The skin and muscle under the arm and extending onto the upper back can be transferred whilst still attached to a blood supply in the armpit (pedicled flap). This is a good technique when the patient has no excess tissue on the abdomen. 3. Tissue from the upper outer thighs (the "saddlebag" area). This is only used when the above tissues are not available and is transferred as a free flap. 4. Tissue from the buttock area. The tissue is transferred using microvascular techniques (see 5). 5. Perforator flap reconstruction is a new technique which uses microvascular techniques, but reduces the potential problems of the donor site (where the flap is taken from) eg DIEP flaps. The artery and vein supplying the skin and fat is dissected out. When the tissue is transferred, more of the muscle and fascia from the donor site is preserved. This results in greater strength and less potential problems at the donor site. Dr Belt is able to offer this type of reconstruction in some select patients (not all patients are suitable). These techniques can be performed as immediate or delayed reconstructions. They may consist of one or two staged operations. Excellent results can be achieved. Prostheses are best avoided in people who have had, or may require radiotherapy. Immediate reconstructive cases will require the use of an initial tissue expander. This is a device that can be serially inflated with saline to increase the volume of the reconstructive breast, and in so doing, will increase the amount of skin overlying the breast. These devices can be left as the definitive implant (e.g. Mentor Becker devices) and result in a single stage reconstruction. Other types of tissue expanders will require removal, and replacement with the definitive breast prosthesis (i.e. a two stage reconstruction). This technique involves the reshaping of the remaining breast tissue after a breast cancer is removed. The breast will be smaller than before the removal of the cancer. This technique may improve the shape of an older or drooping breast. There are many factors which influence what will be the optimum type of reconstruction for you. Dr. Belt is able to offer all of the above modalities of reconstruction. 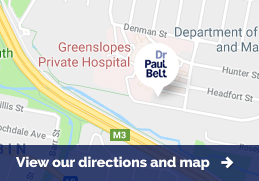 For a consultation, advice or a quote, please call Dr. Belt’s team on (07) 3852 6800. It is also possible to perform a delayed type breast reconstruction using breast augmentation alone. It should be noted that this technique is not suitable for reconstruction performed at the time of the mastectomy (immediate reconstruction). It may be necessary to perform a two-stage procedure using a tissue expander and then a breast augmentation. In the delayed type reconstruction, in select individuals, it is possible to perform a reconstruction in a manner very similar to that of a standard breast augmentation. The only differences are that the incision employed is usually that of the mastectomy scar on the upper outer part of the breast. The implants are classically placed in a submuscular pocket and generally a textured, cohesive, anatomical implants are used. It is possible to reconstruct a breast using the largest breast implants available. Dr Belt has performed this in patients with using implants of up to 650cc volume. The advantage of this technique is that it avoids the need for serial inflation and is a single-stage procedure. It should also be noted that this technique is not suitable for patients who have had previous radiotherapy to the breast area. Dr Belt will be happy to advise you if you wish to proceed with surgery. This surgery also attracts a rebate from both Medicare and private health funds.